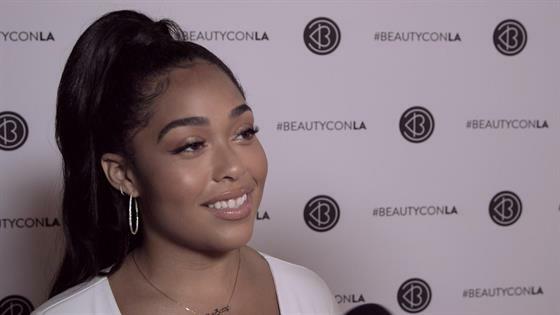 Jordyn Woods couldn't be prouder of Kylie Jenner. The reality star spoke exclusively to E! News at Beautycon about the growth she has seen in Stormi Webster's mom. "I think just people grow and evolve every day and when you become a parent you have to keep learning and it's an experience and I have just seen her blossom and mature, so it's nice," the 20-year-old shared. The BFF is even prouder of her friend's cover on Forbes' "Richest Self-Made Women" issue, especially at such a young age, "It's insane, because one: we are 20, almost 21-years-old, and to be even ranked on the list when they could have picked anyone for the cover is amazing, I couldn't be more proud." And while the birth of Stormi has definitely changed the Kylie Cosmetic founder's way of life, that doesn't mean she doesn't need her friend anymore. Jordyn says, "It's just how any relationship would be, you just have experiences together." Those new memories the BFF's share together include trips to the snow-covered mountains and cuddles with Kylie's five-month-old daughter. Kylie sure is lucky to have such a great friend!